We just sold our 10th Site! 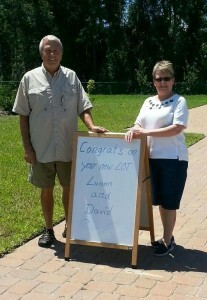 Congratulations and a warm welcome to Luann and David on the purchase of Site #14. They are so excited to be joining the Myakka River Motorcoach Family and we are thrilled they’ve decided to make this their “home away from home”! They are the 10th site owners here and thus, the last members of our Founders Club. We are wishing them many years of happiness on their new site. For others interested in site ownership, please contact our Sales Office at 941-740-2599.